Why Exactly Should Alcohol Be Avoided During Pregnancy? When you become pregnant, there’s a few lifestyle changes you know you need to make in order to keep you and baby healthy. Quitting smoking, increasing the number of vitamins and minerals in your diet and cutting out alcohol, are all recommended to ensure the pregnancy progresses as it should. However, while you may know things such as alcohol can be harmful to baby, you may not fully understand why. It also doesn’t help that laws regarding drinking alcohol during pregnancy differ between states. 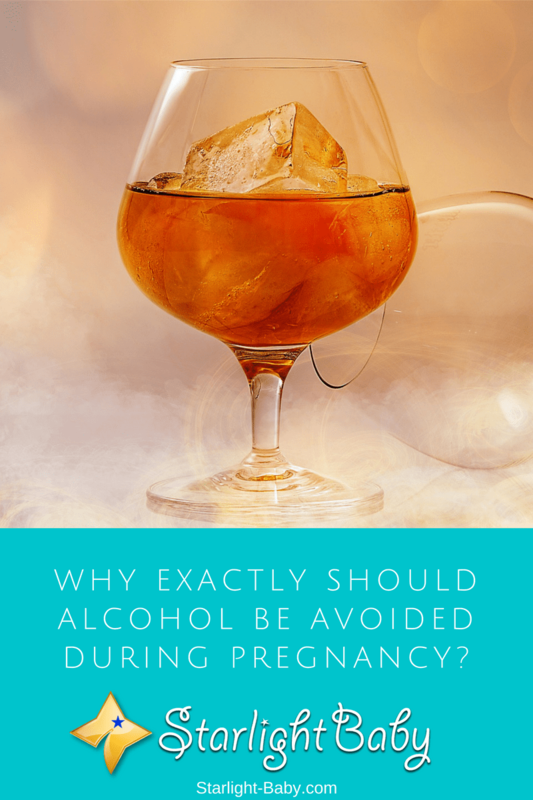 So, why should alcohol be avoided during pregnancy and do you really need to eliminate it completely? 1. Alcohol Is Passed Onto Baby Via The Placenta – You likely already know that whatever you eat and drink gets passed onto baby. It’s no different when it comes to alcohol. When you have an alcoholic drink, it passes through the placenta and enters baby’s bloodstream. The trouble is, your baby’s body is much smaller than yours, which means it takes a lot longer for the alcohol to leave baby’s bloodstream. This therefore increases the risk it will have a negative impact on baby’s health. 2. Any Alcoholic Drink Can Be Harmful To Baby – You might think only strong alcoholic beverages would be potentially harmful to baby, but you’d be wrong. Any type of alcoholic drink, however weak, can cause damage. 3. It Can Significantly Impact Baby’s Health And Development – Alcohol has the potential to significantly impact your baby’s health and development. Within the first three months of the pregnancy, there’s a risk of damage to baby’s nervous system and organs. This is because it’s not until the second trimester when baby’s liver fully matures. So, until then they are unable to process alcohol in the same way an adult can. There’s also the chance drinking in early pregnancy can lead to a miscarriage, premature birth and birth defects. In severe cases, drinking during pregnancy could lead to your baby being born with Fetal Alcohol Spectrum Disorder. There’s actually a range of Fetal Alcohol Spectrum Disorders (FASD), and all of them are caused by drinking alcohol during pregnancy. They can cause abnormal facial features, learning disabilities, hyperactive behavior and problems with the bones, kidneys or heart. The most serious out of the FASD’s is Fetal Alcohol Syndrome (FAS). FASD’s are preventable and caused solely by alcohol consumption during pregnancy. The CDC has estimated, each individual with FASD, costs around $1 million throughout their lifetime. However, for those with more severe problems, the cost can be significantly higher. It’s said to cost the US $4 billion a year for those diagnosed with the most severe type, FAS, alone. It’s not just the cost which should stop you from drinking too much alcohol however. The quality of life for those diagnosed with FASD can be pretty poor. Is It Safe To Drink Small Amounts Of Alcohol? Most of us know that drinking excessive levels of alcohol during pregnancy can be extremely harmful to baby. However, what about drinking small quantities? There’s a lot of mixed advice out there relating to how much alcohol is safe during pregnancy. The truth is, nobody actually knows how much alcohol is safe to consume. This is because everyone reacts to alcohol differently. Studies have also shown very confusing, conflicting results, leaving many experts to simply suggest not drinking any alcohol at all for the nine months of the pregnancy. Everyone also has a different view of what mild, moderate and severe drinking is. So, it’s really difficult for doctors and healthcare professionals to give a proper guideline. Generally speaking, the odd small glass of wine to mark a special occasion isn’t typically going to cause any problems. Many pregnant women who drink very small quantities of alcohol occasionally throughout their pregnancy, go on to have totally healthy babies. However, to be on the safe side, it is better and much safer for baby if you can cut alcohol out of your diet completely until after the pregnancy. Healthcare professionals don’t tell us to avoid alcohol during pregnancy to spoil our enjoyment – they do it for a genuinely good reason. So, now you know why alcohol should be avoided during pregnancy. What are your thoughts? Did you drink while you were pregnant? Share your feelings below! Anything that is literally consumed by a pregnant mother is surely transferred to the baby in the womb, the same goes for nursing mothers who still breastfeed their babies, anything eaten is directly fed to the baby through the breast milk. Pregnant and nursing mothers should take care with what they eat because of the health and safety of their babies. Yes, that’s true, Martinsx. Everything taken by the mother is passed on to the baby so she should always be careful. Coffee is a no-no so how much more with alcohol? A mom who truly loves her baby will stay away from alcohol. Exactly, the baby is still very fragile to have such substances absorbed from their mother, so it’s very paramount that mothers take care with what they consume and pass on to their little ones. The baby’s health and care should be the priority of every loving mother and depriving yourself of some certain food/drink for your child’s health shouldn’t be a big deal. When you’re used to drinking alcoholic beverages occasionally, chances are that when you get pregnant, you’ll crave for the usual things you do when you’re not pregnant. However, I do believe that when we’re pregnant we should always put the baby’s welfare first. Meaning, we should be mindful of everything we do and eat. From the moment of conception, we should now start making sacrifices for our unborn baby. After all, it’s not forever we’ll be carrying the baby inside our bodies but just nine months and I think it’s pretty short time to make those little sacrifices. When I was pregnant, I never consumed alcohol, not even a drop. And I’m happy to say that I have a healthy baby boy after nine months! Congratulations on your healthy baby boy! and for sacrificing your ‘wants’ for your baby’s welfare. That is what a responsible mom should do. As you’ve said, what is nine months or two years (for someone breastfeeding) if it’s for your baby’s health? That is not too much to ask. I am not in total support of pregnancy moms taking alcoholic drinks especially during the early months of the time to avoid it being harmful to the baby. I am that type of person that will educate my wife on the need not to take alcohol drinks while pregnant for that is a way to ensure the baby will be hearty during delivery. No husband should ever support his wife to drink alcohol once she finds out she’s pregnant. That is a no-no! The baby’s health should be the primary concern, not one’s whims. As much as I love to take alcohol and knows how good it makes one feel sometimes when you take it responsibly, it’s still not enough reason for a pregnant or a nursing mother to be encouraged to partake in it because it’s 100% harmful to the child either in the stomach or still sucking breast. There is no justification for any mother who puts her baby at harms way by taking alcoholic beverages. I just hope that most of us that have the privilege of being here in this platform would learn from all the valuable tips and information provided for us all here and use it effectively in our family lives and possibly teach our close relatives who are ignorant of these knowledge. Even before my wife was pregnant and the doctor told us to avoid drinking and smoking, I already knew the harmful effects of alcohol on baby’s health. I also knew that alcohol will pass into the baby’s body through the placenta. Not only the pregnant woman, even the nursing mother should avoid alcohol because alcohol will pass into the baby’s body through milk. Yeah, the nursing mothers has also got a big role to play as regards what they eat while breastfeeding the baby for it’s a known fact that whatever they eat tend to be sucked by the baby during breastfeeding. Babies depend 100% on what they eat from sucking breast from the first to possibly 9 months or depending on some parents decision on when to include other food to their meal. So absolute care should be taken by the nursing mother with whatever they are eating as their babies is 100% consuming from such food intake through breast milk. Good on you, vinaya. I hope more husbands become as aware as you are about pregnancy. The baby’s health should always be the top priority during this delicate stage in a woman’s life. It will only be for a few months anyway so the parents, especially the moms-to-be, should be mindful of what they eat and drink. With my first child I was drinking two glasses of wine a day before I found out I was pregnant . I was told that my doctor is actually more dangerous to stop drinking then it is to continue. You have to wean yourself off of it. Congratulations on your healthy boy! You are lucky indeed. Congratulations! on your healthy baby boy 🙂 It does seem that your baby boy made a lot of difference in your life and made you a better person and mother. Good for you! We wish you the best with your baby girl and your family life as a whole.